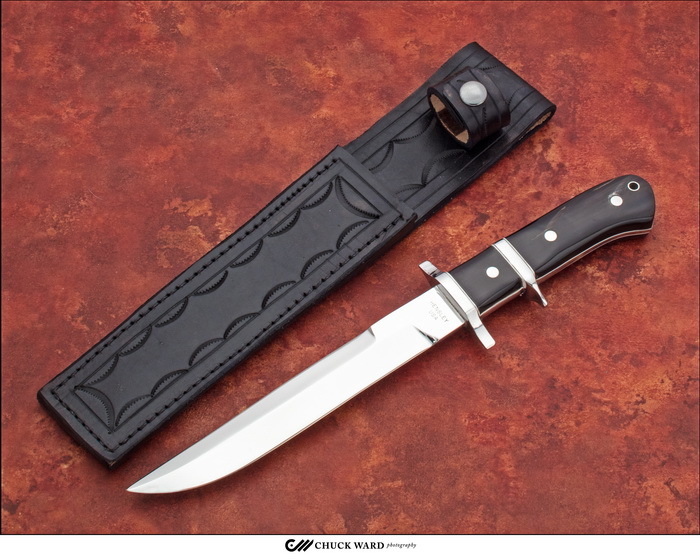 **** Chosen by Winner: Timothy G.
Knifemakers' Guild VP Wayne Hensley has crafted a Double Edge Sub Hilt with a mirror polished 7.5-inch blade of ATS 34 high carbon steel and Buffalo Horn scales.A leather sheath by the maker is provided. I started making knives part-time in 1973 while working for the telephone company. In 1978 I joined the newly formed Knifemaker’s Guild and currently serve on the Board of Directors. Originally I marked my knives with an arrowhead with my initials – wHg – but in 1980 I changed the marking to HENSLEY.In 1999 I retired from BellSouth after 38 years of service and became a full-time knifemaker. 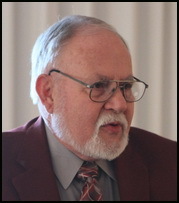 I have been a resident of Conyers, Georgia since 1965, residing with my wife Rebecca and raising two Eagle Scout sons, both of whom are now married. I am a member and usher of the First Baptist Church of Lithonia; a member (and past president) of the Flint River Knife Club; I am also a member of the following organizations: Minature Knifemaker’s Society; Chattahoochee Cutlery Club; Citizens Sheriff’s Academy Alumni Association of Rockdale County; National Wild Turkey Federation; Ducks Unlimited; and, the Georgia Custom Knifemaker’s Guild (where I presently serve on the Board).I am “Granddad” to grandsons Ryan and Garrett.